Into the previous post How to run Spring Boot and MongoDB in Docker container I described how to start ==Spring Boot== web application and MongoDB in docker using Dockerfiles. Described approach works, but has some drawbacks: we need to remember all commands and repeat them from time to time. Into this tutorial I’ll describe how to build locally a Docker image with Java application and run it together with MongoDB in Docker containers using Docker Compose. Clone the following demo application or use any existing java application. 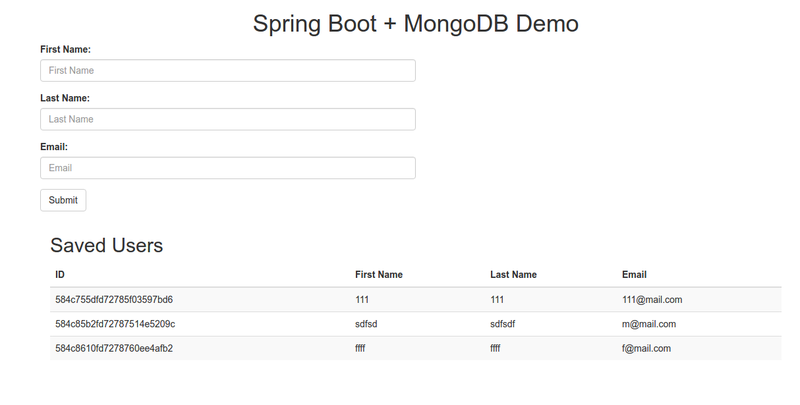 Into this tutorial I will use springboot-mongo-demo application. Make sure build/libs/springboot-mongo-demo.jar file is created. We’ll need it a little bit later. To run our containers with Docker Compose we need some docker preparations, like docker and docker-compose installation (if not installed yet) and docker-compose.yml and Dockerfile for our Java application. # Required for starting application up. specifies the URI which will be used for connection to MongoDB. More interesting here is the springboot-mongo:27017. It contains the name (springboot-mongo) of our docker container with Mongo DB. Some words about Alpine images. Docker-Alpine image is a super small Docker image based on Alpine Linux. The image is only ==5 MB==. More information can be found in its Github repository. Docker Compose file (docker-compose.yml or docker-compose.yaml) is a YAML file defining services, networks and volumes. More details can be found into the docker compose-file official documentation. Let’s take a look closer at this file. container_name: springboot - specifies a custom container name, rather than a generated default name. ports:8182:8080 - exposes ports, ie maps the host 8182 port to the container’s 8080 port. By default, spring boot runs web application on port 8080. We can specify any free port on our computer/laptop/Virtual Machine were docker runs and map it to the container’s port. working_dir: /opt/app - sets the working directory for any RUN, CMD, ENTRYPOINT, COPY and ADD commands. depends_on: mongo - our springboot container will depend on mongo container, and will be started after the mongo. mongo: the name of our mongo service. volumes: - mount host paths or named volumes, specified as sub-options to a service. It means that our host/local folder $HOME/data/springboot-mongo-data will be mounted as /data/db inside our running container(s). WARNING: Image for service springboot was built because it did not already exist. To rebuild this image you must use `docker-compose build` or `docker-compose up --build`. Because we specified build: . in our docker-compose.yml file, It will build springboot container first and then will start springboot after mongo container. The docker-compose up command aggregates the output of each container (essentially running docker-compose logs -f). In case when the command exits (Ctrl + C is pressed), all containers are stopped. For more details please see the official documenation. Our running web application should be available in browser by this URL : http://localhost:8182. Now we can create some users. Let’s take a look at how to attach bash to the running container approach. We’ll talk about exposing ports a little bit later in this post. the console/terminal will be changed to something like: root@ff55937c3772:/#. It means we’re inside the docker container. The ObjectId , firstName, lastName and email will differ from specified here. Here I’ll provide some information which can be useful for working with Docker and Docker Compose. This part of the article contains information about how to update our running docker containers with our Java application and MongoDB. ==Please note:== in case if Dockerfile was updated, the image with Java application won’t be recreated and container won’t be restarted by docker-compose up -d. How to update the image with Java application described bellow. By now, let’s take a look at concreate example by exposing ports for MongoDB container. After containers are restarted we’ll be able to connect to Mongo DB using any GUI application (e.g Robo 3T) by specifying 27018 port in connection properties. Our springboot container won’t be updated bacause we built it locally from Dockerfile. run docker-compose build command. It will verify changes in Dockerfile and recreate image in case when Dockerfile was changed. As you can see container with mongo was not recreated and restarted. Into the next part I will describe how can we build any docker image locally, push it to Gitlab’s Docker registry and use it in our docker-compose.yml file.